Automated Email marketing is thought of as so common that in many companies it is an afterthought that fails in its mission. 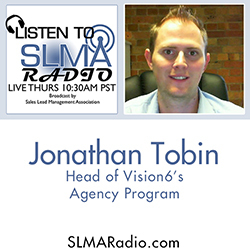 In this program Jonathan Tobin the head of Vision6’s agency program tackles how email marketing programs can succeed where others fail. He will be joined on the interview with Henry Vesander who manages the sales and customer success team in the company’s Australian office. The host is Jim Obermayer. Jonathan Tobin is the Head of Vision6's Agency Program. In this role, he is responsible for helping digital marketing agencies and marketers use email marketing automation to drive value for their customers. Jon previously served as the Head of the Vision6 Customer Success team, leading the company’s core initiative to help customers realize value from the product. Jon has over ten years of experience in email marketing.